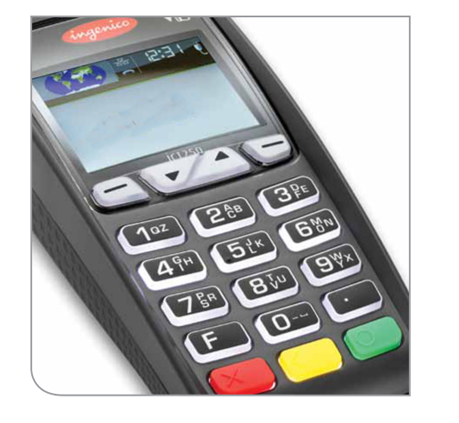 This is all-in-one countertop terminal features everything you need to easily and securely process payments.The iCT250 supports a full range of payment types including credit,debit,EBT and gift cards.And it’s ready for the acceptance of secure EMV “chips” cards,protecting you and your customers from counterfeit card fraud.The iCT250 also has integrated Contactless technology that extends the convenience of “top and go” payments and prepares you for the acceptance of mobile wallets. Supports payment types including credit, PIN, debit, electronic gift card and electronic benefits transfer. Contactless capabilities provide customer a convenient way to pay with chip cards,key fobs or mobile wallets. “Magic Box” cable management system prevents cable tangle and clutter. Automated download features keeps your payment application up to date with the latest enhancements.